Last week we played a great Phases of the Moon card game. 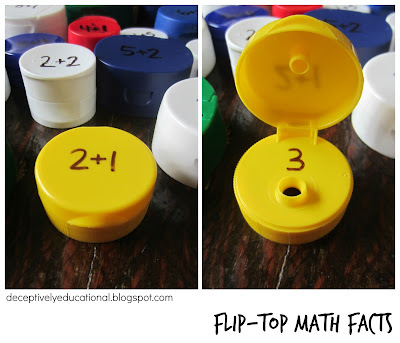 This week I reused the graphics for another fun activity. 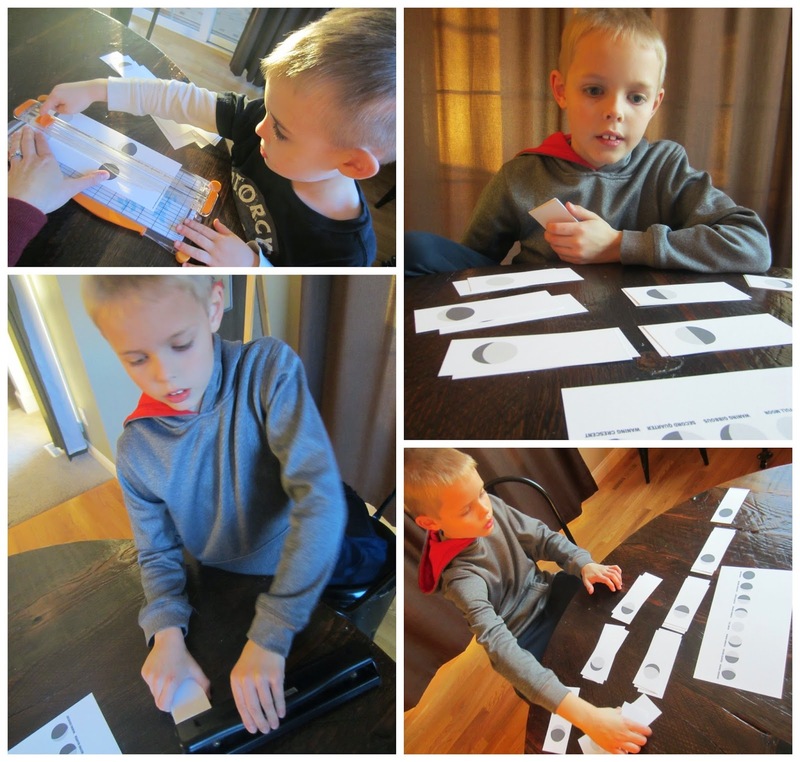 I designed flip book pages, so my son could make his own "animation" of the moon moving through eight phases. I handed my oldest son three copies of the pages, which he cut out using my personal paper trimmer. Even our 5-year-old got in on the action. Once the pages were all cut apart, the 9-year-old sorted them into piles. With that completed, he looked at the reference sheet and put the piles in order. With the cover page first, he began pulling one page from each pile, placing them after the one before. Next we used the three hole-punch to make holes in the left side of all the pages. 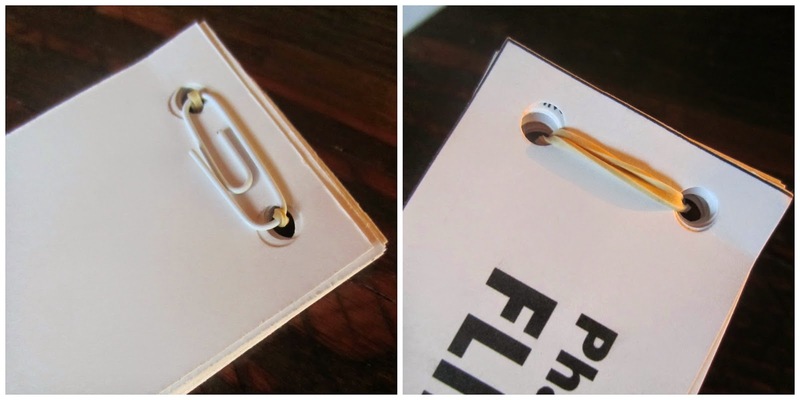 Finally we added a tiny rubberband and paperclip as the binding. 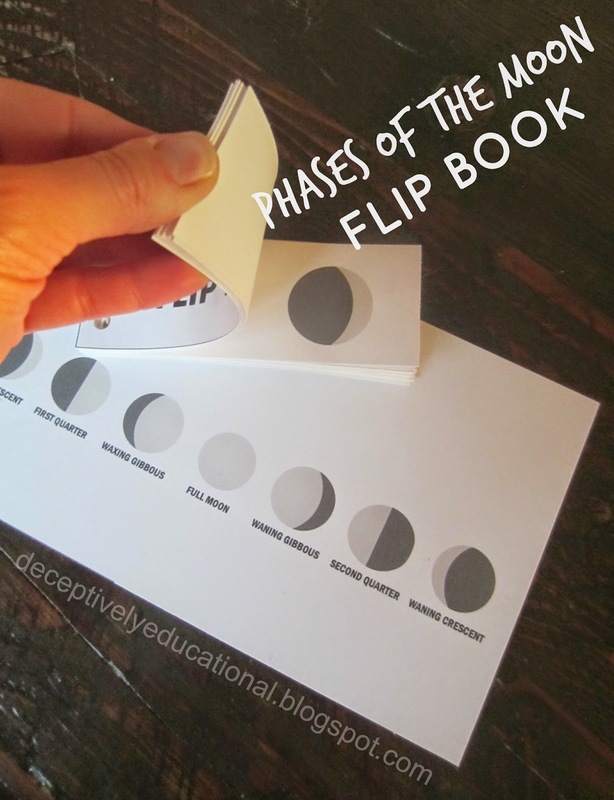 Now came the fun part: flipping the pages to see the moon change! My son thought this was the coolest! Download the free 2-page PDF of these pages from Google Drive here. And then flip out! This idea was inspired by an activity in the book Science Crackers Awesome Astronomy by Raman Prinja. Thanks for sharing! Perfect for my unit! Smiles and stop by anytime! I'm doing a unit right now on the day and night sky. This will be perfect! If you have a second, stop by. Thank you so much for sharing!! We are beginning our unit on the moon phases and the sky next week, this is perfect! Thanks for putting this up! I teach English in Taiwan and I was looking for a fun activity to end my night and day lesson! This is perfect! Just a small note. The "second quarter" moon phase is usually referred to as "last quarter" or "third quarter"
Thank you so much for making this for FREE! I'm on a new year's budget, and I really appreciate it! My second graders are going to LOVE it!